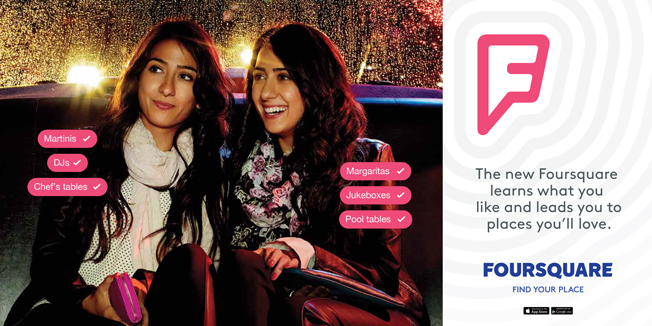 For the next six weeks, New Yorkers and Chicagoans will see ads from Foursquare on their commutes as well as in their smartphone-based social media streams. The multimillion-dollar effort is the mobile app's first brand campaign, and the food-driven creative clearly takes on Yelp and Urbanspoon. "The ads really go after the idea that we all have different tastes and different friends," said Jeff Glueck, chief operating officer of the New York-based tech company. "We shouldn't always get the same recommendations. The local and travel guides of today could be much better with personalization. So the copy will again and again say, 'The new Foursquare learns what you like and leads you to places you love.'" It's the latest appeal by Foursquare—which Glueck says now has 55 million registered users—to shed its reputation as a check-in app in favor of becoming known as a mobile discovery tool. The five-year-old app hasn't grown at a similar clip to Gen Y-based mobile apps such as WhatsApp, Viber, Tango and Kik. But it wants to attract a larger audience by positioning itself as something folks of all stripes utilize. "The idea of sharing location with your friends might seem a very hipster, millennial kind of phenomena, and it might have been polarizing," the COO said. "We are trying to educate people to try the new Foursquare. You don't have to share your location. You don't have to check in to enjoy it. The campaign is targeted to people aged 20 to 50." His company's promos will appear on 10 percent of New York City and Chicago's commuter trains (in the case of the Windy City, the famed elevated "L" train will be in play), as well as bus shelters and kiosks. The ads will also appear on Chicago's bike-share locations. "You'll also see the ads on Facebook and Twitter," Glueck said. Those will be app-install promos via those social channels' mobile apps. And in a couple of weeks, while working with vendor AdColony, Foursquare will run video pre-roll across various publishers. The online ads will hit other U.S. markets in addition to New York and Chicago. It will be intriguing to watch Foursquare going forward after in August it debuted a second app called Swarm, which offers check-ins. During August, Glueck said, Foursquare saw a 54 percent lift in users compared to the same month 2013. He explained that "a third of our users are using just Foursquare, one-third are only using Swarm, and a third are using both apps every 30 days. We really feel this confirms and validates our assumptions going into the unbundling." Glueck added that Foursquare now entails 50 million tips. "The tips-per-active-user [number is] up 116 percent per week versus the old Foursquare," Glueck said. "We've really made rating places, leaving tips and paying forward with your advice the central actions to the app, and it's working. Whereas before, you may have just checked in." Meanwhile, Judd Branding handled creative for the campaign, while Omnicom Group's Outdoor Media Alliance unit bought the media. Check out the creative below.